Wisdom Quarterly: American Buddhist Journal: Buddhism in SWEDEN is growing fast! It is evident that Europe is changing very rapidly, economically and socially. Although these changes are widely discussed in the media, there are a few that attract very little attention. The change in demography, in particular the growth of alternative religions, is one notable item. Sweden is no exception. Due mainly to the arrival of Diasporas and the organic growth of Eastern traditions, such as Buddhism, many domestic people are paying attention. Buddhism is still relatively small in Sweden. But in recent years it has seen tremendous growth. It is trending, and estimates on new Buddhists are on an upward swing. In April 2011 (the last year for which reliable data are available) it is estimated to have risen to around 35,000 to 40,000 or 0.38-0.43% of the Swedish population, making it the third largest religion after Christianity and Islam. Most practitioners have Asian backgrounds from Thailand, China, and Vietnam. According to official reports in 2011, Buddhism is proportionally the fastest growing religion. There are now several Buddhist temples in Sweden, including Stockholm (Theravada Thai and Sri Lankan), Borås, Eslöv, Gothenburg, Fredrika, and other parts of Sweden. A BNN reader reports that a giant project in the northernmost part of Sweden is underway. 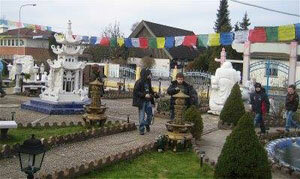 It is supposed to be the biggest Buddhist center in Europe. It has now, however, had to scale back its plans to get clearance for its application to build. 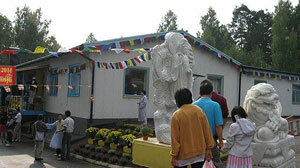 But once the project is completed, Sweden will have an enormous Buddhist center that can facilitate more followers. The Stockholm Buddhist Vihara (monastic residence) is a Buddhist temple in the Theravada tradition. Like old centers in Washington D.C., Los Angeles, and elsewhere, it was established by the Sinhalese community to continue an ancient tradition of spreading the Dharma or Dhamma. The center was built in Sweden in 1985 by the Sri Lanka-Sweden Buddhist Association (SIDA) in conjunction with the arrival of the first resident monastic in Stockholm. 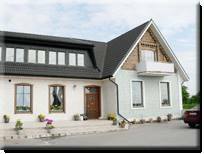 It is the first ever Buddhist temple formed in Scandinavia, and the members are mostly of Sri Lankan origin. SIDA came into being in 1983 as a result of the energetic efforts and dedication of ardent Buddhist devotees who gathered in Stockholm during the winter of 1982 to discuss the possibility of forming an association. Their courage and determination resulted in establishing a temporary organization, which became permanent after a general meeting in March, 1983 at the SIDA Auditorium in Stockholm. Once established in 1985 the Stockholm Buddhist Temple moved to several temporary locations until the monastics and devotees succeeded in acquiring a permanent building for the center in Jakobsberg in 1995. 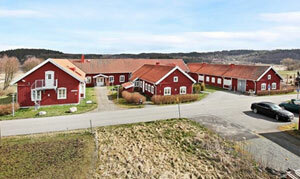 In 2005 Mrs. Eh and her husband Stein donated five hectares in northern Rörum for a temple building. However, lack of municipal water and sanitation would have meant additional costs if it had been built there. So in 2006, Mrs. Eh and her husband found a property, one owned by a Thai/Swedish family, was for sale. They jumped at the opportunity to create a temple in southern Sweden and decided to purchase the property. 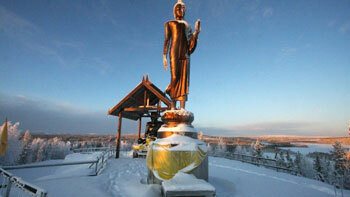 The temple has been built by Theravada Thai Buddhists and their partners living in southern Sweden. They have received help from the monks of Wat Pa in Copenhagen under the direction of Abbot Phar Kru Somsak. Buddhism is not a law or set of dogmas. It is a direct path to enlightenment, something to be undertaken and verified for oneself. Since it is not a "religion" in our Western sense, one need not abandon any faith or creed to practice. It is often spoken of as an Eastern philosophy or a way of life, says the Buddhist monk Bhikkhu Assati. All are welcome here to meditate, not only Buddhists. When the temple at Railway Road 13 in Åstorpsvägen was recently inaugurated, about 100 people attended. Most were Sri Lankan Buddhists from southern Sweden who previously had to travel to Stockholm or Copenhagen, where there are already Buddhist temples. "Some attendees were not Buddhists," says Mr. Nandi Dei Zylva, Chairman of Standing Behind the Temple, a Sri Lankan Buddhist cultural association in Skaane. "My wife, for example, is a Christian." "We’re neighbors with Björnekulla Church, and the pastor and his family came here," continues Mr. Dei Zylva. "They were very friendly and accommodating and said that our visitors were free to use their parking [lot]." "Buddhism, which originated in Nepal and India, has two branches -- ours called Theravada ["Teaching of the Buddha's elder enlightened disciples"] and the Bjuv called Mahayana ["Great Vehicle"]. Theravada is more conservative than the Mahayana. It is much like the difference between Catholicism [which is like universalist Mahayana] and [back to basics] Protestantism." "Regardless of the difference, we have a good working relationship with the temple in Bjuv," adds Mr. Dei Zylva. "Before we got our own [Theravada] temple, we went there often." The temple’s representatives wish many Åstorpsbors will come to visit and meditate. They welcome all who feel the need to replace their daily stress with a moment of contemplative rest. 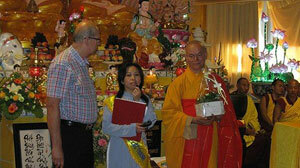 In addition to the Bjuv Buddhist temple of Sweden, there is a Vietnamese temple in Katrineholm.